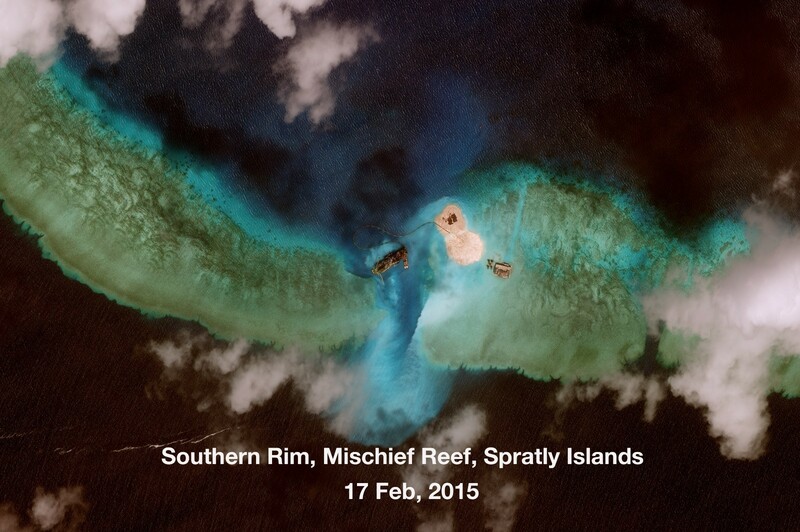 Fiery Cross Reef, Spratly Islands, 14 February 2015. 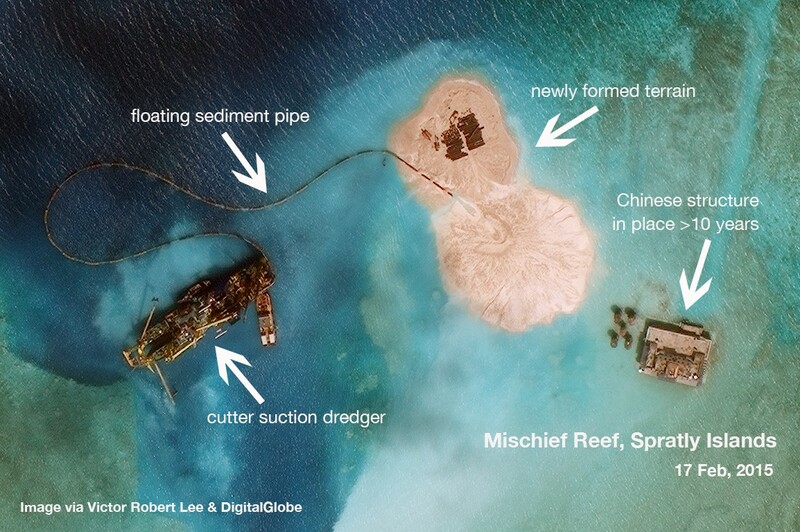 Recent high-resolution images show new areas of reclamation on Mischief and Subi Reefs, and intensive construction on Fiery Cross as well as several other reefs. 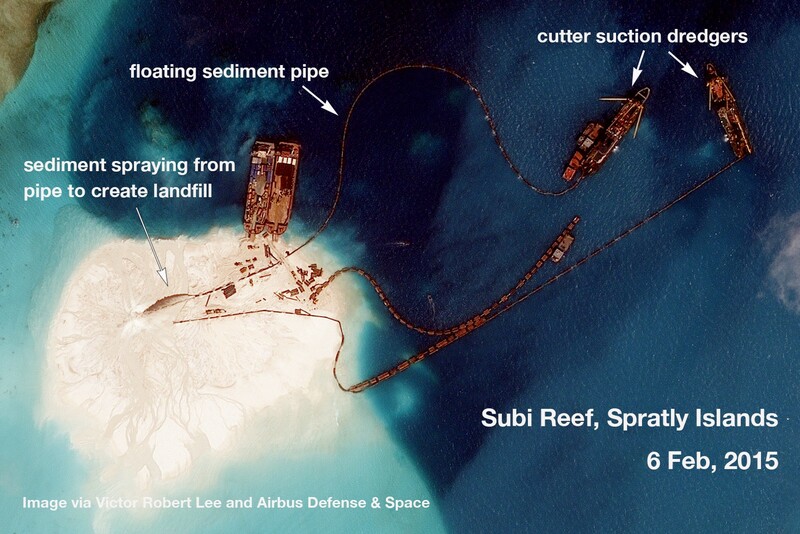 China is rapidly transforming numerous reefs of the Spratly island group into military installations, part of a strategy to solidify its hold on the South China Sea despite competing territorial claims by Vietnam, the Philippines, Malaysia, Taiwan and Brunei. 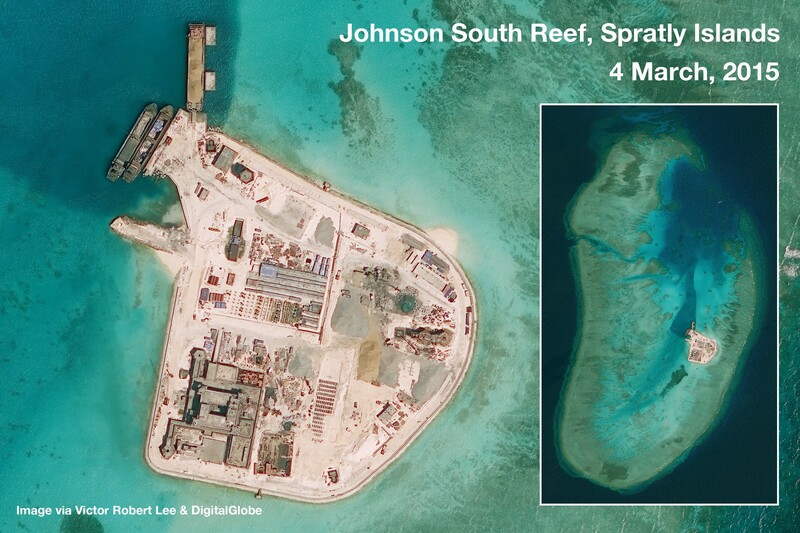 The bases will likely serve to constrain the activities of competing militaries in the region, and appear more than adequate to support air traffic monitoring and enforcement in the event China were to declare an Air Defense Identification Zone over the South China Sea. 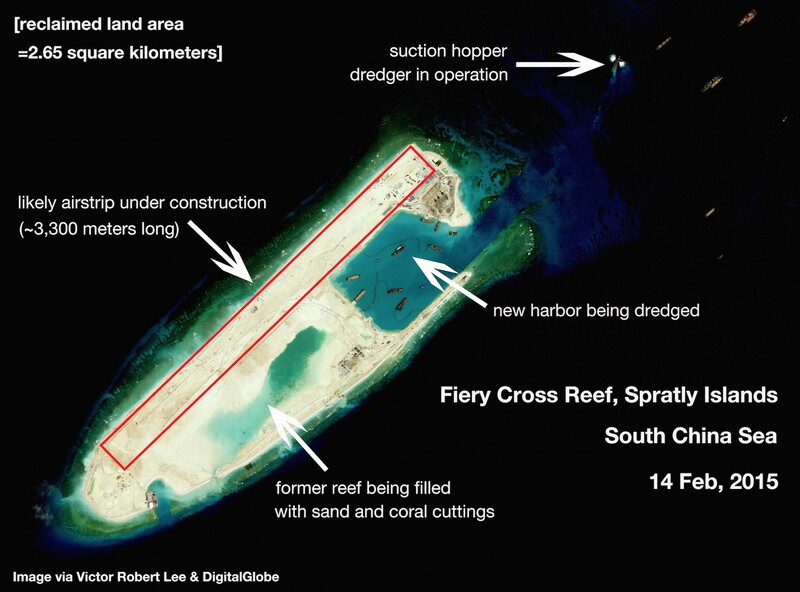 — Fiery Cross Reef, more than 1,000 kilometers from China’s coastline, is close to becoming a combined naval/air base far larger than any other in the Spratly Islands, with a harbor that can accommodate China’s largest naval vessels and an airstrip long enough (~3,300 meters) for most combat and support aircraft in the People’s Liberation Army, Navy and Air Force. 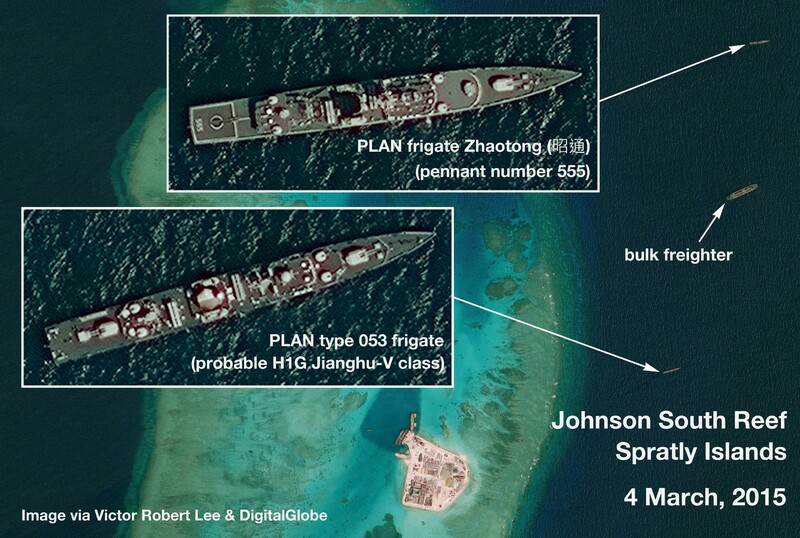 In addition to enabling force projection within the nearby seas, Fiery Cross will significantly reduce the time required for PLA/N aircraft and ships to reach the Malacca Straits in the event of a blockade of this major trade artery. 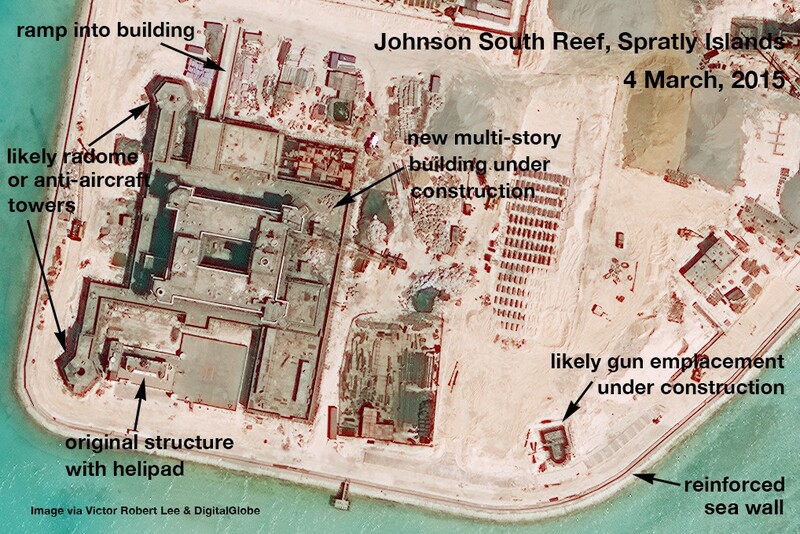 — New structures being built at Johnson South Reef include likely radar towers, gun emplacements and a large multi-story building with a footprint larger than 530 square meters (Vietnamese press photos from December 2014 show it to be more than ten stories high). 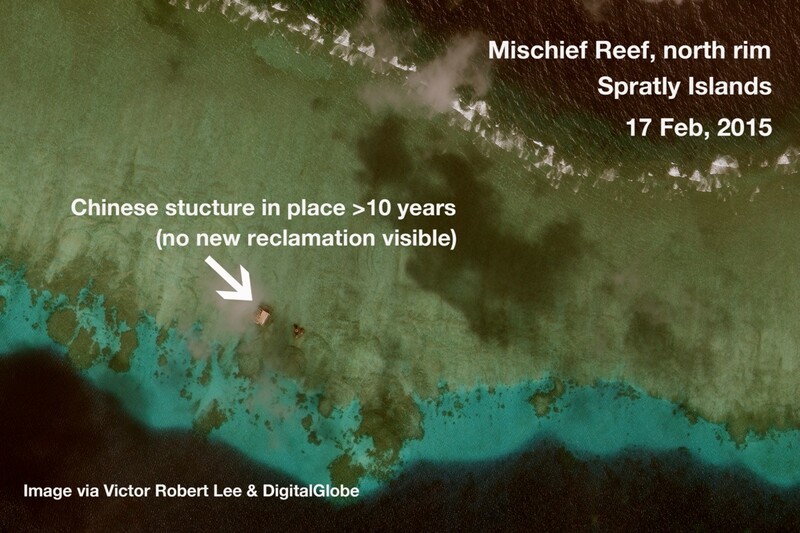 There is no sign of airstrip construction, contrary to other recent reports. 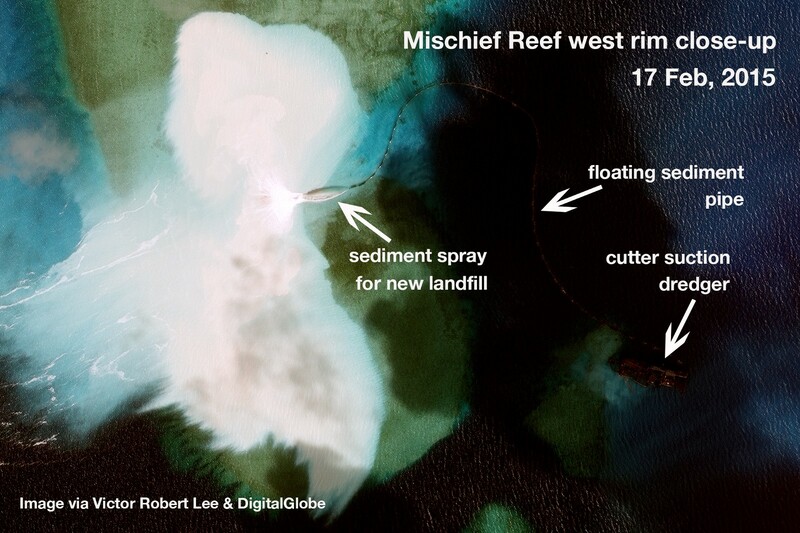 — A cutter suction dredger is creating new landfill on the southern rim of Mischief Reef, and another landfill, heretofore unreported, is underway on the western rim of Mischief Reef. 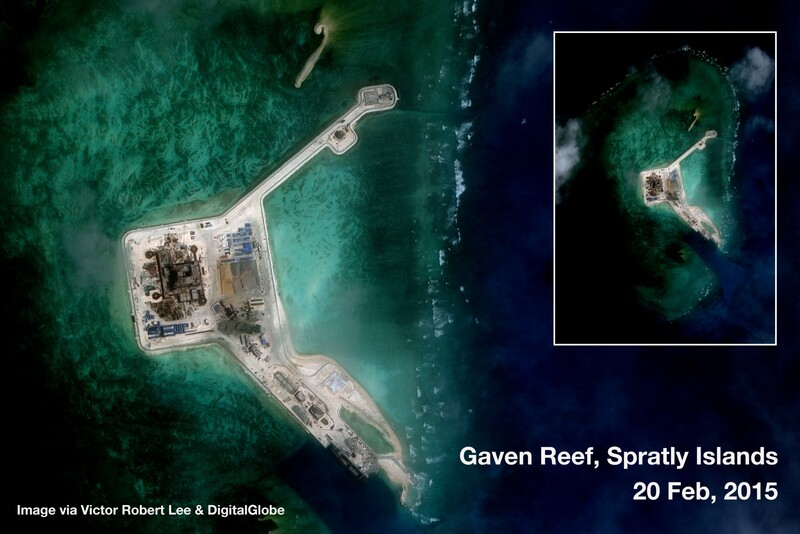 — Ongoing construction at Hughes, Gaven and Cuarteron Reefs includes large, multi-story buildings, radar towers, and likely gun emplacements; reinforced sea walls and ship docks are complete or nearly complete. 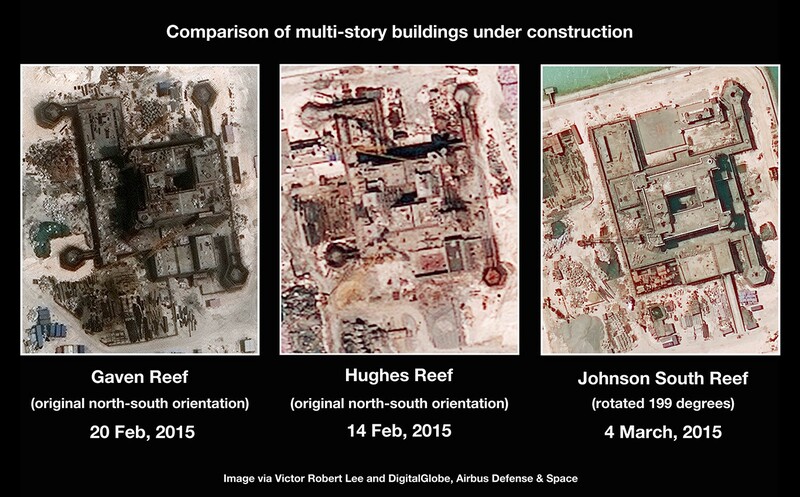 The buildings under construction at Hughes and Gaven Reefs are nearly identical, and are similar to that on Johnson South Reef. 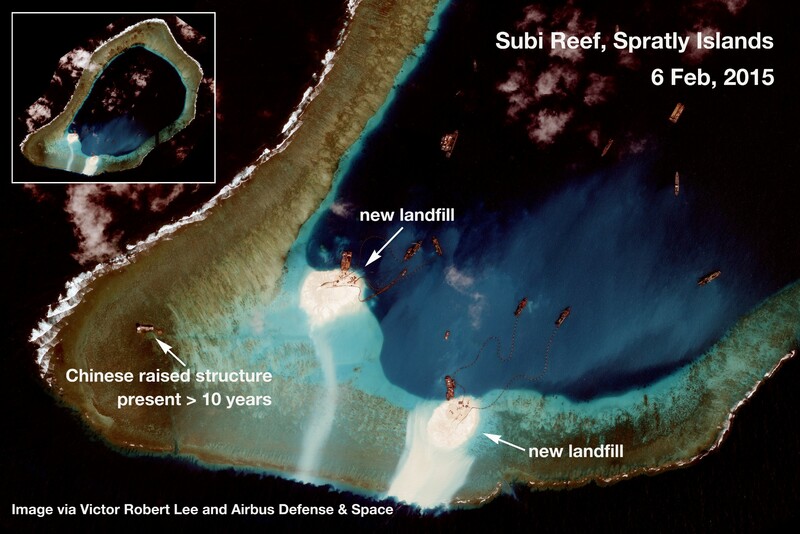 — New landfill is underway at two locations on southwest Subi Reef, with four cutter suction dredgers in operation and more than a dozen additional construction-related vessels nearby. 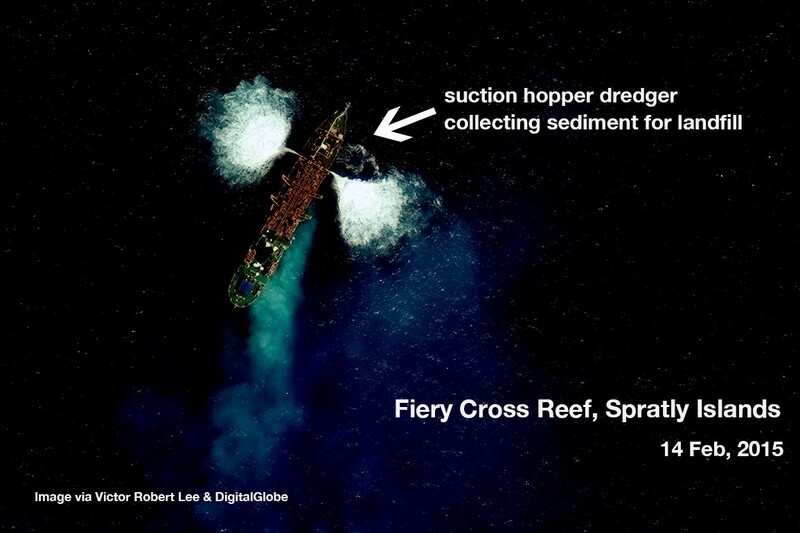 — The northern tip of Eldad Reef shows probable nascent landfill and likely suction dredger tracks on the nearby seabed, but no vessels are seen in the current image. 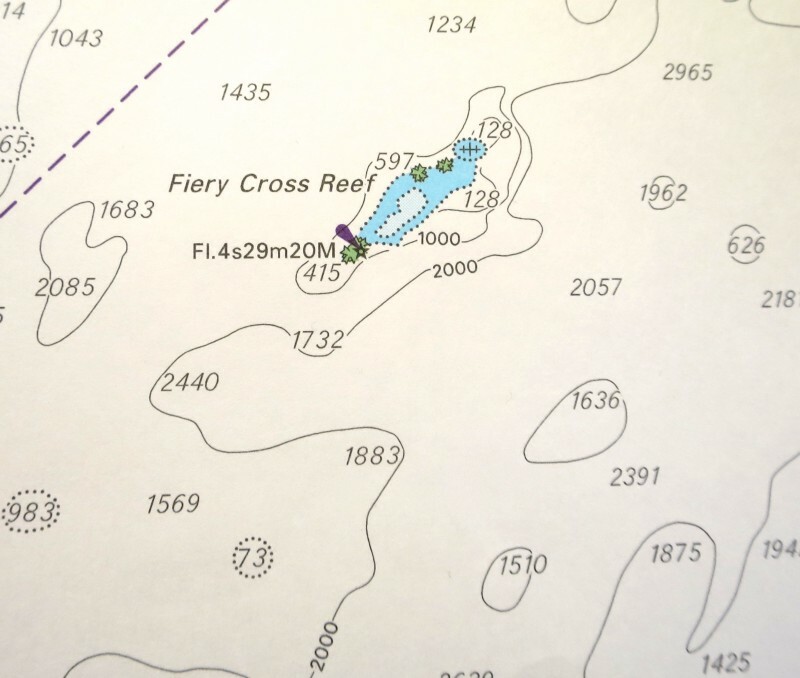 Depths shown in meters. U.K. Hydrographic Office. 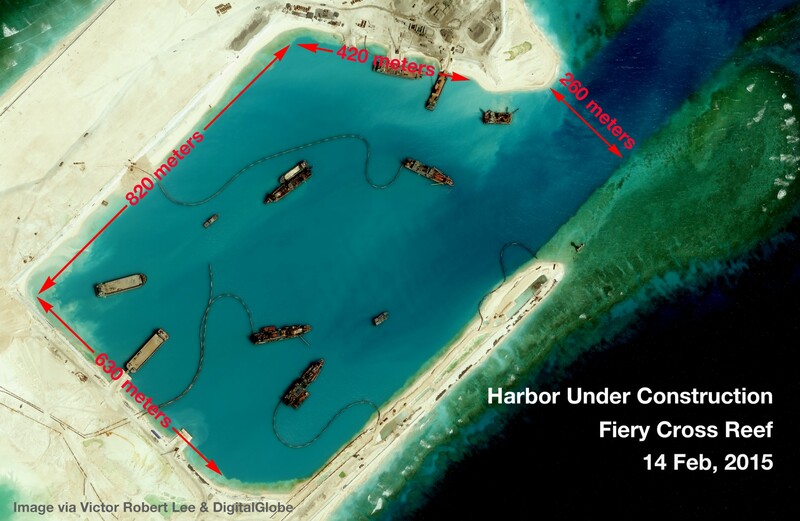 — The newly built harbor at Fiery Cross Reef (now an island) affords quick access to deep waters (2,000 meters depth within a few kilometers from shore), better suited to submarine basing than the shallow waters surrounding the PLAN south fleet’s harbor at Hainan Island. 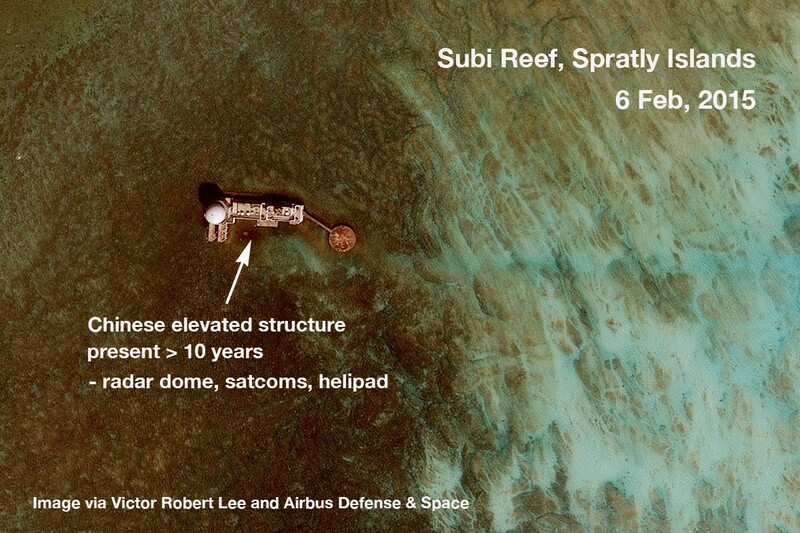 — The deep waters near all of the eight reefs analyzed here are also viable channels for the submarines of other navies (U.S., Vietnamese, Singaporean, Japanese, for example); the PLAN can be expected to use its newly built-out bases to deploy fixed ocean-floor acoustic arrays as well as to support other forms of air, maritime and anti-submarine surveillance. 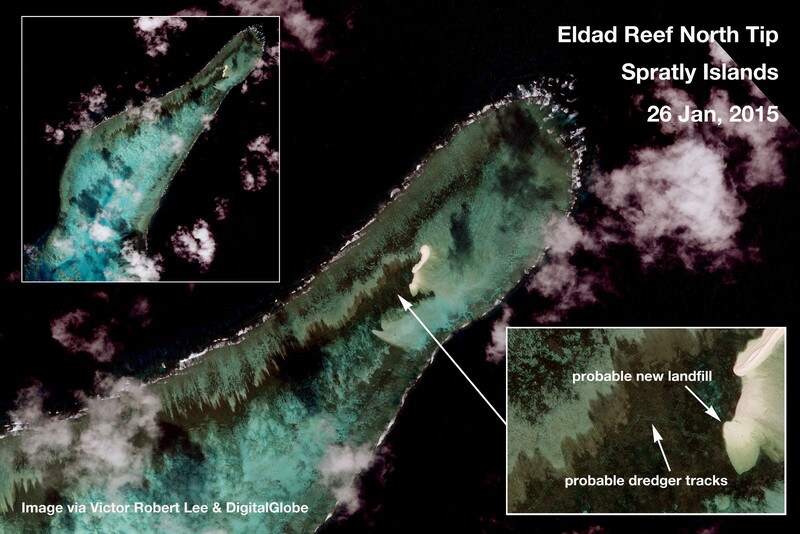 China is not alone in beefing up military facilities in the Spratly Islands; Vietnam has recently reclaimed land at Sin Cowe Island, and Taiwan is carrying out a US$110 million port expansion and airstrip reinforcement at its Itu Aba (Taiping) Island, a mere 22 kilometers from the new Chinese base at Gaven Reef. 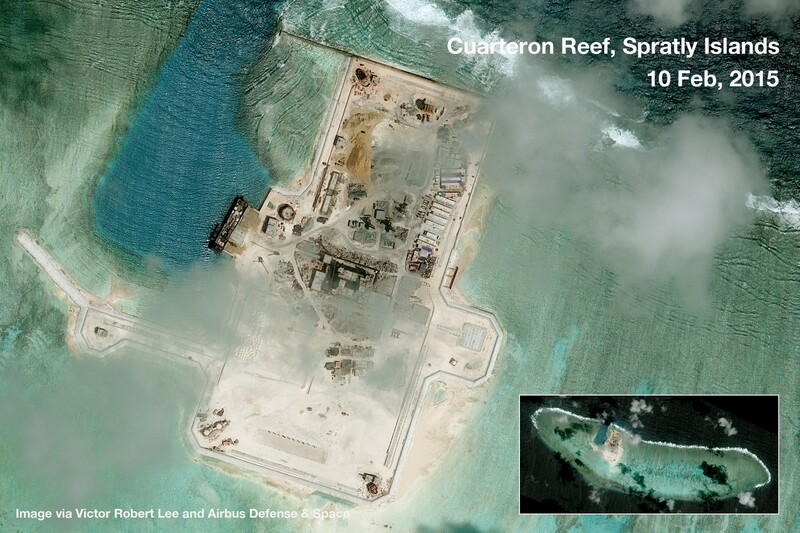 However, these measures by Vietnam and Taiwan are dwarfed by the scale, quantity, and capabilities present in China’s militarization of the Spratlys. 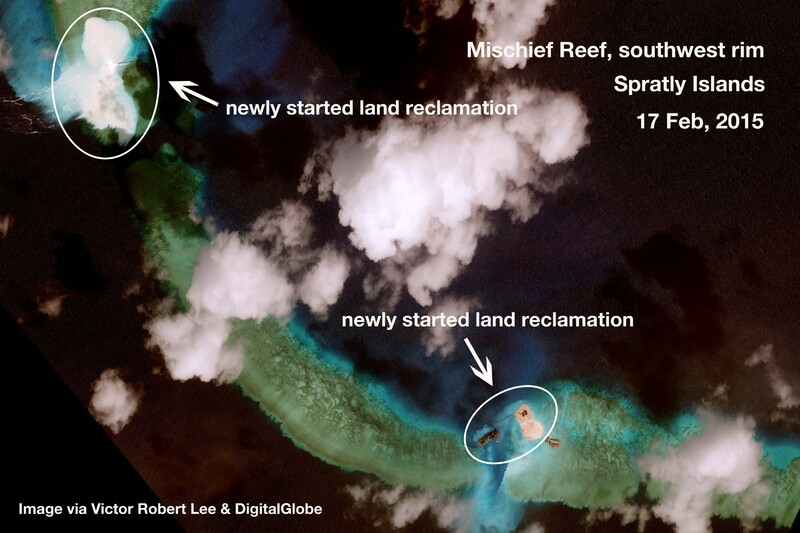 The strategic importance of China’s Spratly Islands expansion was made evident in September of 2014, when Wu Shengli, commander of the PLA Navy, personally made an inspection of each of the newly filled-in reefs, according to Lee Hsiang-Chou, the head of Taiwan’s National Security Bureau. 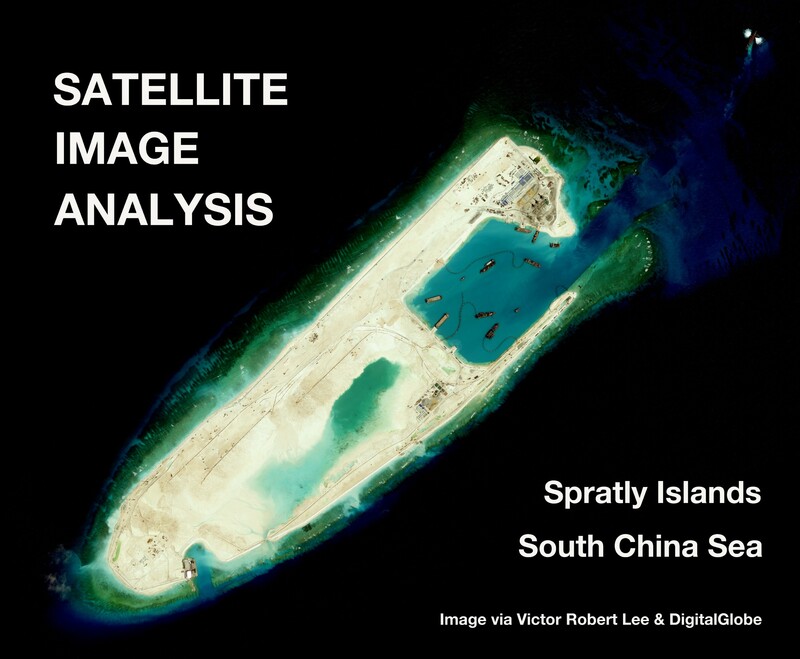 In a presentation to Taiwanese legislators, Lee also stated that China’s President Xi Jinping had personally authorized five of Beijing’s new military sites in the Spratlys. Victor Robert Lee reports from the Asia-Pacific region and is the author of the espionage novel Performance Anomalies. 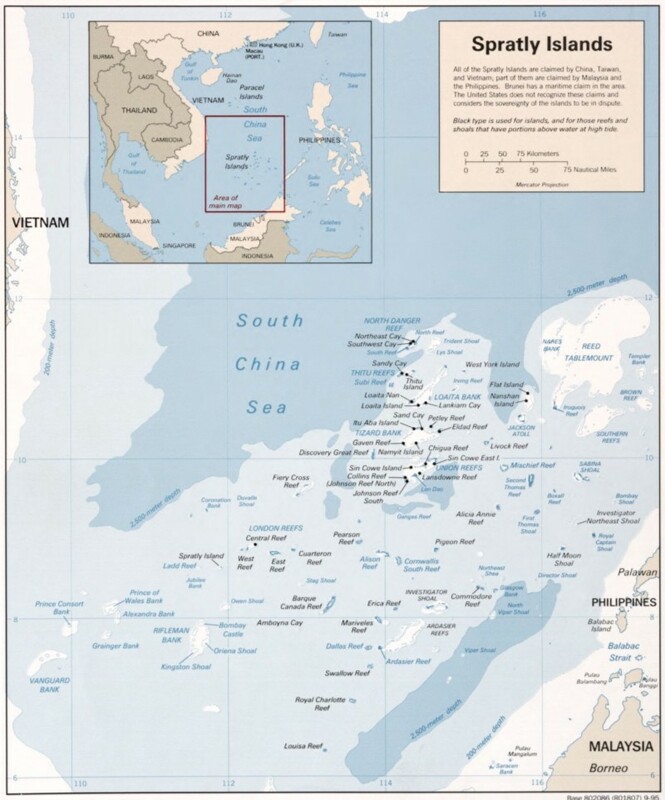 His non-fiction articles on the South China Sea, the East China Sea, China, Indonesia, and other Asian territories can be found in The Diplomat and elsewhere. 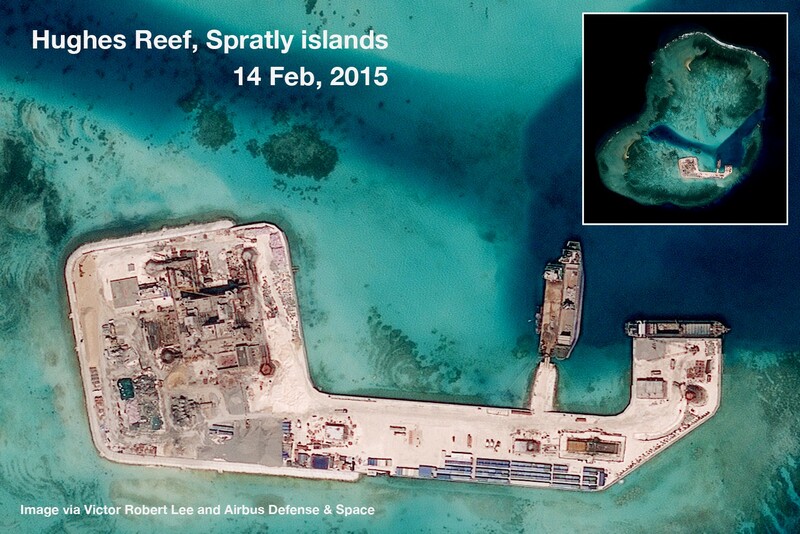 Victor Robert Lee writes on the Asia-Pacific region.